Fresh homemade salsa beats the jarred stuff hands down and only takes about 10 minutes to make. You can easily double this recipe and use it over the next 3 days with nachos or to add instant oomph to a frittata, quesadilla, wrap, cooked fish, pork or steak (see recipe below). Watch Bell Peppers 4 Ways below for more great ideas. Try this salsa over the trout in the sheet pan dinner featured here too. Dietitian's Tip: If your kids are like most, they are not getting enough fibre. Pairing beans and veggies is a good way to solve that problem. *Kids Cook: Young kids can rinse the canned beans and toss up all the ingredients in a bowl. Make the dressing. In bowl, whisk together 2 cloves minced garlic, 2 tbsp white or red wine vinegar, 1 tsp hot sauce, ¼ cup canola oil. In same bowl add, ½ small red onion, minced, 1 EACH red and yellow sweet pepper, seeded and chopped, 1 cup frozen corn, thawed and 1 can black beans (rinsed). Toss vegetables to coat in dressing. Season with ¼ tsp EACH salt and pepper. 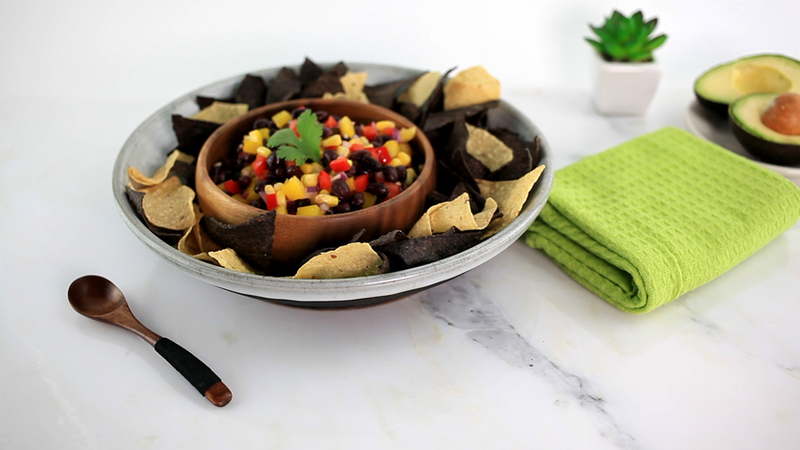 Serve with baked pita wedges or nacho chips. • Pack this for lunches. Store the baked pita wedges and salsa in separate containers. • Add ¼ tsp of red pepper flakes to dressing or add 1 jalapeno, seeded and minced.